EXTRA EXTRA Heavy Duty Plastic! Geomembranes Built to Outlast and Perform! XR Geomembranes are the most durable and strongest geomembranes in use today. They are specified worldwide for projects including wastewater impoundments, landfill liners, floating covers, tank farms, and potable water applications. Each XR Geomembrane is capable of performing in the hardest, most difficult environments. When challenging projects call for containments involving chemicals, oil, or environmental hazards in either very hot or extremely cold climates, XR geomembranes retain their flexibility and provide outstanding performance. XR geomembranes are highly resistant and non-degradable with extreme tear and puncture resistance, as well as dimensional stability under temperature fluctuations and under high loads. There is no need to worry for a possible containment failure. The impressive dimensional stability, puncture resistance and tensile strength are a function of the proprietary weave design of DuPont Dacron® polyester fibers which provide maximum strength to weight rations, and flexibility for ease of handling. All XR Geomembraneproducts are classified as an Ethylene Interpolymer Alloy (EIA). They are very stable, with low thermal expansion and contraction properties and come in factory panels over 15,000 square feet (1400 square meters) for less field seaming. Specified worldwide for projects including floating covers, tank farms, wastewater impoundments, landfill liners and potable water applications, XR Geomembranes are capable of performing in the harshest possible environments. Seaman's XR-5 grade geomembranes are high-strength, chemically resistant membranes that are best suited for high temperatures, and broad chemical resistance applications, including acids, oils and methane. Floating Baffles: These baffles are used to upgrade wastewater treatment facilities by preventing short-circuiting, thus increasing hydraulic detention time, and increasing plant capacity. They utilizing the tough polyester base fabric, the XR-PW has the highest tensile strength of any potable water baffle material. Leachate Ponds: XR-5-lined impoundments safely collect and store both leachate and storm water prior to treatment. Geofoam Coverage (9832 XR-5 G): reinforced geomembranes gain strength from the base fabric, plus they are less thick or rigid compared to their unreinforced counterpart. Evaporation Ponds: The storage, production, and pipeline transportation of natural gas results in the need to dispose of, or manage, salt water. In arid portions of the U.S., membrane-lined evaporation ponds have proved to be an economical, effective method of disposing of this brine water. XR-5® material is ideally suited for the intense heat and UV resistance necessary in many applications, including wastewater impoundments and evaporation pond liners. Read about actual examples of this application below. De-Icing Impounds & Fire Training:Airports utilize geomembranes to protect groundwater supplies from pollution generated in fire training exercises and in de-icing operations. XR-5® is widely used in these applications because of its resistance to jet fuel, glycols and acetate de-icers. Because the XR-5 has low thermal expansion-contraction properties, it does not require soil cover and can be left UV exposed. Process Wastewater: XR-5 is widely used as an impoundment and tank liner for a variety of chemical, petroleum, and process waste waters. Floating covers manufactured from geomembranes are a popular solution to odor containment. They are an integral component of low rate anaerobic digestion systems. 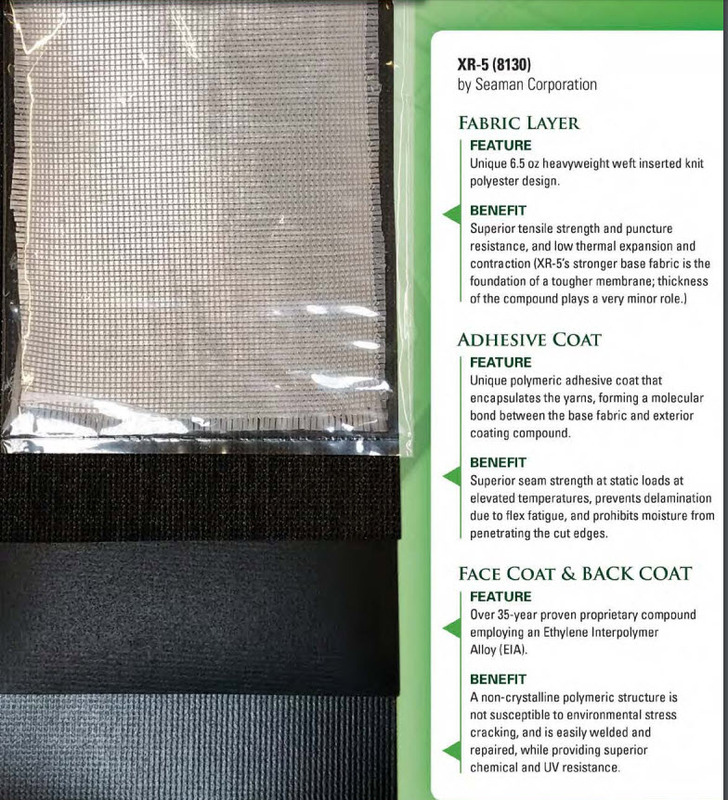 XR-5® offers many features for this application including superior seam strength under elevated temperature constant loading, essential to personnel that must walk on the floating covers.The broad range of chemical resistance and flexible nature of the membrane make it the ideal material for floating cover construction. Pillow Tank/ Tank Liners: Polyurethane geomembranes were developed specifically for above-ground tank bottom liners and pillow tanks for containment and storage of harsh chemicals such as fuel. With a unique base fabric and perfectly formulated coating, Seaman Corporation polyurethane geomembranes are engineered to resist abrasions, punctures, and corrosion caused by harsh chemicals. Even in the most extreme environments, a polyurethane tank liner continues to remain flexible and reliable. Heap Leach Pads: The extraction of precious metals from ore using heap leaching is a common method of production. The ore is placed on geomembrane-lined pads and the ore-laden solution is drained through lined ditches into impoundments for holding prior to extraction. XR-5® is commonly used in these areas due to its resistance to sunlight and thermal swings. Prefabrication makes installation simple and minimizes CQA requirements. Impoundment and Tank Liner: XR-5 is used for a variety of chemical, petroleum and process waste waters. Secondary Containment of Spills: XR fabric is designed with the durability necessary for secondary containment of spills for short periods of time, even in the most catastrophic situations. Tank Floors: Geomembranes are often placed under the steel floors of bulk storage tanks and function as a barrier for both leakage containment and to allow enhanced monitoring. XR-5 geomembrane functions as a barrier both for leakage containment and to allow enhanced monitoring. Oil Booms: XR Geomembrane is one of the world’s largest suppliers of reinforced membranes for long-term oil boom use. Advantages of 30 mil XR Geomembranes vs 60 mil HDPE: Thicker is Not Better. This is a material inherent problem identified by the EPA. XR-5 geomembranes are not subject to ESC. Prefabrication of XR-5 geomembranes allows for improved liner integrity and significantly reduces the number of field seams. HDPE is too rigid to prefab. Therefore, all seams are field seams which translates into longer installation time, higher installation costs and lower membrane integrity. HDPE suffers from extreme thermal expansion and contraction. Contraction is 22 times lower with XR-5 geomembranes, eliminating the need for design consideration of thermal effects. XR Geomembranes are the strongest, most durable geomembranes in use today. See how XR Geomembranes compare to other options when exposed to a wide range of tough contaminants.